He was born in Moscow in 1492. When his father died, his mother became a nun and he a monk, receiving the monastic name Macarius. He became an iconographer of rare talent. In 1523 he was ordained to the priesthood and made Abbot of the Monastery of Luchski; three years later he was consecrated Archbishop of Novgorod and Pskov, a see which had been vacant for many years. 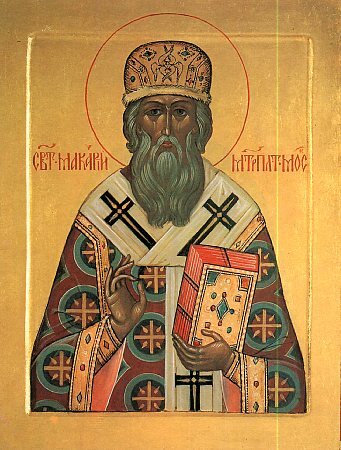 As Archbishop, he sent missionaries to the native peoples of the far north of Russia and, within his own diocese strove against the paganism still common among the people. He regularized life in the monasteries of his diocese, which had fallen into self-indulgence. In 1542 he was elected Metropolitan of Moscow and head of the Russian Church. Five years later he crowned the first Tsar of Russia, Ivan Vassilievich. In 1551 he summoned the Council of the Hundred Chapters, which condemned various heresies prevalent at that time, laid down principles of Christian conduct and education, and established rules for iconography and Church art. Throughout his time as a hierarch, he continued to paint icons, and in 1553 he brought about the production of the first books to be printed in Russian. When the Khanate of Kazan fell, he immediately sent missionaries to convert the Tatars. When the Tsar, who revered Saint Macarius, asked him for a spiritual book, he was surprised and displeased to be given a copy of the funeral service; but the Saint told him that anyone who read this book carefully and applied its words would never sin. Saint Macarius reposed in peace in Moscow in 1563, and his popular veneration began immediately. In 1988 he was officially glorified by the Church of Russia.